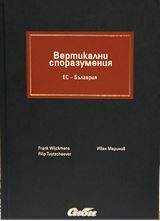 The Bulgarian publication “Vertical Agreements, EC – Bulgaria” („Вертикални споразумения, ЕС – България”) is part of a truly pan-European project. It is co-authored by Ivan Marinov (Иван Маринов) and based on a more extensive monograph published by Oxford University Press under the title “Vertical Agreements in EU Competition Law” authored by Frank Wijckmans and Filip Tuytschaever. This monograph is the spider in a web of a series of local editions published in the local languages. The Bulgarian publication is one of them. The whole project was officially presented at a special conference in Brussels on the 3 May 2018. The Bulgarian publisher is Sibi – click here.